Amazon has policies against hateful products, but a new report finds that it could be doing far more to enforce its own rules and tamp down hate-based merchandise on its platform. The report, published on Friday by the US Action Centre on Race and the Economy (ACRE) and Partnership for Working Families, lists dozens of specific examples of offending products, such as swastikas, lynching costumes, and a baby romper featuring an anti-Muslim Pepe the Frog. Amazon notes on one of its restricted products pages that among the Offensive and Controversial Materials prohibited from selling products on its services are ones that “promote or glorify hatred, violence, racial, sexual or religious intolerance or promote organisations with such views.” Nazi imagery and other racist symbols inarguably fall into this category, and the report aims to spotlight how Amazon’s weak enforcement of this policy is insufficient and unacceptable. 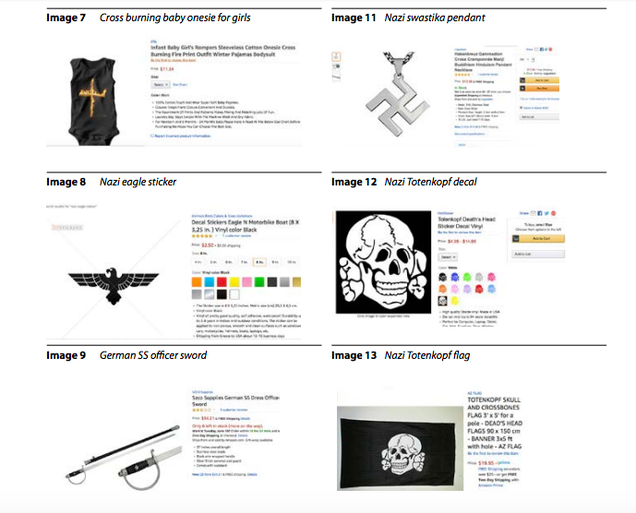 Some of the white supremacist imagery the authors of the report found on Amazon were available to purchase as recently as June. And their findings weren’t limited to just Amazon’s main online shop. The authors also discovered that at least seven hate groups identified by the US Southern Poverty Law Centre (SPLC) were selling Kindle content as of last month. The report also indicates that white supremacists were selling print publications using Amazon’s CreateSpace service. Hateful content was also being distributed on Amazon’s music streaming and digital download platforms as of last month, the researchers found. What’s more, ACT for America, which SPLC has labelled an anti-Muslim hate group, is reportedly using Amazon’s content delivery network CloudFront. The authors note in the report that hate movements in the US are renascent, pointing to recent reports from the country's SPLC and the Anti-Defamation League, which highlighted a surge in far-right violence last year. “As hate groups grow and become increasingly emboldened, it is more important than ever that Amazon create and implement effective policies and practices so the company is not spreading or profiting from these ideologies,” the report states. The report includes a number of recommendations for Amazon on how it can assume responsibility for the hateful content on its platforms—content that propagates hateful ideologies and provokes violence. “As a wealthy corporation, it has the resources to ensure its policies are enforced,” the authors note. Amazon made $3 billion (£2.25b) in profits last year, and Jeff Bezos, the company’s CEO, is the richest man in the world. The report suggests that Amazon develop stronger policies across all of its services with the help from experts on hate movements and symbols. It also states that Amazon needs to destroy hateful products in its warehouses and distribution centres. Of course, given the volume of products posted to Amazon services each day, it’s in some measure expected that the company won’t flag every instance of violating material. But it’s clear its policies are substandard if dozens of overtly prohibited products were still for sale as recently as June of this year. With dangerously hateful content slipping through the cracks, the behemoth has a responsibility to develop better policies and more rigorously enforce them.